Elasmar, M.G. (2003). (Ed.). The impact of international television: A paradigm shift. Mahwah, NJ: Lawrence Erlbaum Associates, Inc., Publishers. For several decades, cultural imperialism had been the dominant paradigm for conceptualizing, labeling, predicting, and explaining the effects of international television. It had been used as an unchallenged premise for numerous essays on the topic of imported television influence, despite the fact that the assumption of strong cultural influence was not necessarily reflected in the body of research that exists within this field of study. 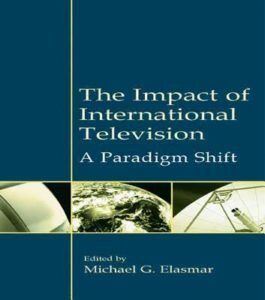 In The Impact of International Television: A Paradigm Shift, editor Michael G. Elasmar and his contributors challenge the dominant paradigm of cultural imperialism, and offer an alternative paradigm with which to evaluate international or crossborder message influence. In this volume, Elasmar has collected original research from leading scholars working in the area of crossborder media influence, and contributes his own meta-analysis to examine what research findings actually show on the influences of crossborder messages. The contributions included here illustrate points, such as: the contentions of cultural imperialism and the context in which its assumptions emerged and developed; the complexities of the relationship between exposure to foreign television and its subsequent effects on local audience members; the applicability of quantitative methods to a topic commonly tackled using argumentation, critical theory, and other qualitative approaches; and the difficulty of achieving strong and homogenous effects. In bringing together the work of independent researchers, The Impact of International Television: A Paradigm Shift bridges over 40 years of research efforts focused on imported television influence, the results of which, as a whole, challenge the de facto strong and homogenous effects assumed by those who support the paradigm of cultural imperialism. The volume sets a theory-driven agenda of research and offers an alternative paradigm for the new generation of researchers interested in international media effects. As such, the volume is intended for scholars, researchers, and students in international and intercultural communication, cross-cultural communication, mass communication, media effects, media and society, and related areas. It will also be of great interest to academics in international relations, cross-cultural and social psychology, intergroup and international relations, international public opinion, and peace studies.